If it is possible, take the person shopping with you! 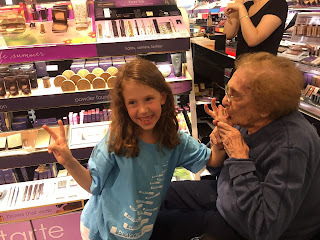 My grandma loved going to department stores and sampling perfume and cosmetics. My mom said smelling fragrances can remind someone with dementia of pleasant memories. Grandma's favorite perfume was: JOY. We took my mom to Sephora and asked the salesperson for perfume samples. Grandma and I had so much fun! People with Alzheimer's disease could sometimes have trouble smelling things because the part of their brain that can smell is not working right. But if you give the person a big spritz of the perfume sample they should be able to smell it. Take your loved one to the department store or cosmetics store (like Sephora). Get some free samples of perfume. Spray the wrists of your loved one and ask them to tell you about the smell. Here I am with grandma at Sephora. Grandma loved smelling the different perfumes, but also loved kissing my hands!